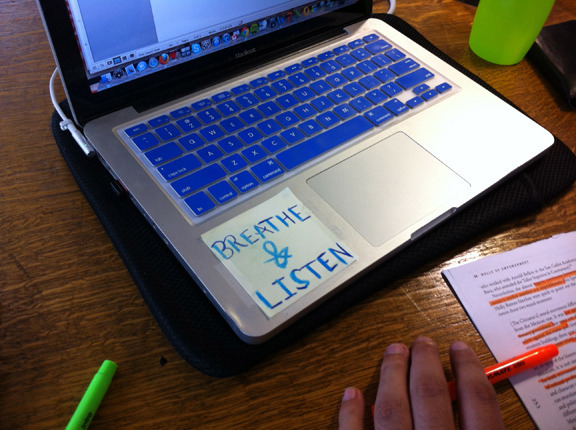 I was walking throug the library recently and happened to notice this post-it taped to someone’s laptop. That someone was a large, burly and athletic-looking undergraduate guy; not someone I would have expected to have such a new-agey sentiment so prominently displayed on his computer. I hesitated but was so curious I had to ask him about it. He was happy to explain its’ origins. He is a representative on a student governance organization at UC Berkeley and said he found himself repeatedly getting worked up about insensitive comments made by others during the meetings; so much so that he’d had a couple outbursts which he was embarassed about. He thought the message on the post-it might make him think twice before saying something he’d later regret. I asked him if it worked. Yeah, he said, it actually did cause him to pause and reconsider his anger during meetings. It had been on there about 3 weeks by the time we talked. This is something which BJ Fogg would call this a “hot trigger”; an actionable reminder put in the path of someone who was motivated to modify their behavior. I also like that this is actually a 2-step process, implying that before you can get to get to the listening part you must first breathe. Words of wisdom for all!